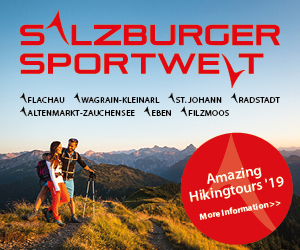 The Salzburger Sportwelt is a member of Austria’s Hiking Villages. The basic requirement for membership on this site is the Austrian Hiking Seal of Approval. 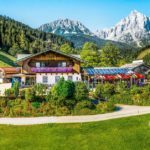 The 7 resorts of the Salzburger Sportwelt have to fulfill the criteria of certifying 4 of its villages, 4 trails and 8 hiking accommodation properties. Mr Andreas Kranzmayr from the Union for Quality Assurance for Hiking in Austria came to inspect one of our hiking routes for this very reason. The hiking route “The Queen’s Trail“ in Filzmoos from the Aualm to the Sulzkaralm and on further to the Hofpürglhütte and to the Hofalm was inspected. 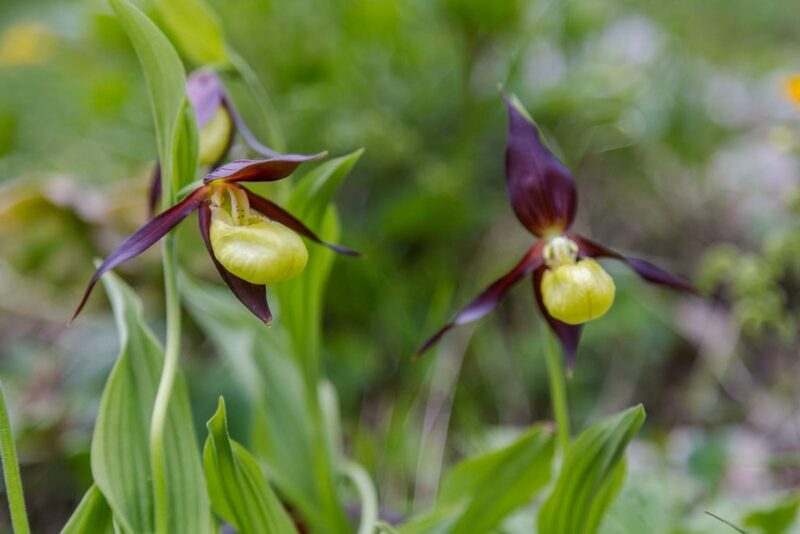 Along the Queen’s trail the orchid – the Queen of the Flowers – takes centre stage. However, this assessment is not about the flowers, but about the condition of the paths, the signposting, the starting point, the benches and the whole appearance of the trail. As I’m interested in the expert’s opinion and I’m expecting lots of useful suggestions, I also take part in the hike. Plus the weather’s gorgeous, far too nice to spend the day in the office. We start at the Kirchgasshütte/Aualm, as that’s the starting point for the Queen’s Trail. Even the starting point is rated positively by Andreas. 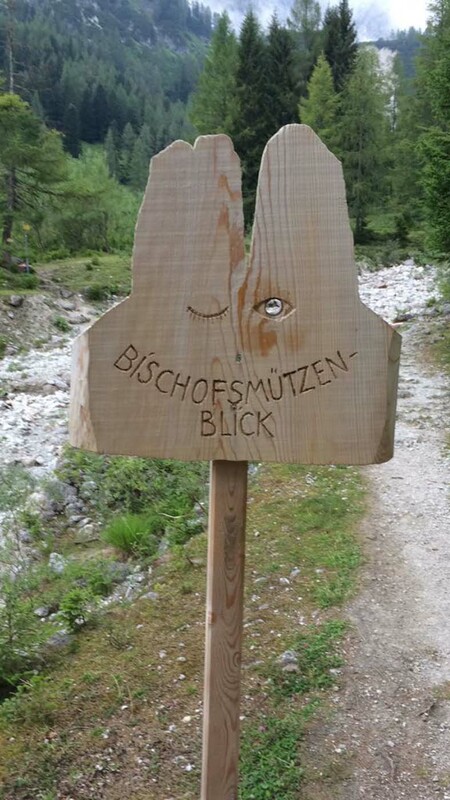 You can get to the Kirchgasshütte at the Aualm either on foot (walking time approx. 1.5 hours from Filzmoos) or on the “Almi“ hiking shuttle. The first part of the trail between the Aualm and the Sulzkaralm is for the most part okay and is praised by Andreas. Just before we reach the Sulzkaralm, however, we come across a number of shortcomings, a few signposts and benches should be renewed. Along the way there are “views“ e.g. the “Bishofsmütze View”, which Andreas likes very much. 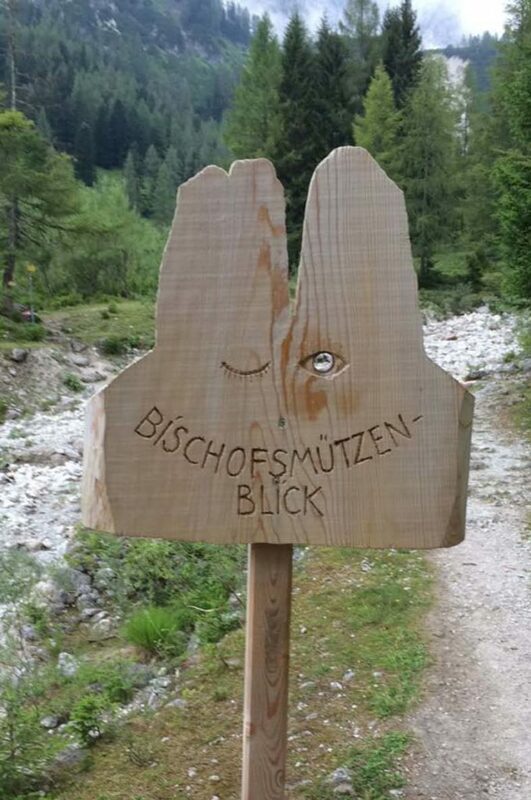 In the case of the “Bishofsmütze View“ it’s a piece of wood, portraying the shape of the mountain with two eyeholes. You can look through one of the eyeholes and see the peak of the Bischofsmütze, which Andreas finds a great idea. Now and again along the way Andreas gives me tips on how we could make the trail more attractive. Just before the Sulzkaralm there’s a bench with a view of the Hochkönig. We should definitely incorporate this theme as it were, as it’s a great photo point from the hiking queen to the “high-king“. After a short stop at the Sulzkaralm and view of the “Stone Eagle“ we hike on higher to the “Austriaweg“. I get a bit out of breath – Andreas, who hikes a great deal, is of course just as fit as at the start of the hike. Along the Austriaweg he suggests we improve two fence stiles plus stage the view of the “Kampenbrunn“ power spot beneath the Bischofsmütze better. 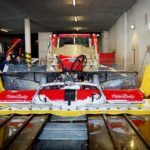 At the Hofpürglhütte – an Alpine Club Hut – we meet up with the hut manager Heinz Sudra and have a good chat. Heinz is an excellent climber and has set up a natural climbing park with over 400 climbing tours in all levels of difficulty in the area around the Hofpürglhütte. 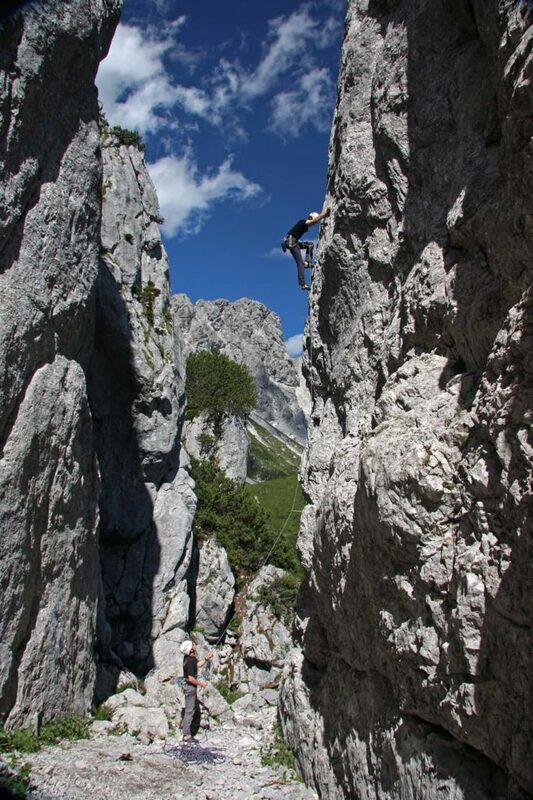 The climbing park is the largest natural climbing park in the whole of Austria and is used by sports climbers who otherwise normally climb indoors. Afterwards we take the “Wastl-Lackner-Trail“ down to the Hofalm. Andreas is impressed with the varying scenic landscapes along the Queen’s Trail. In the area around the Sulzkaralm you’ll mostly find overgrown, hilly landscapes and around the Hofpürglhütte and the Hofalm you’re surrounded by gigantic chalk mountains, to which the Bischofsmütze belongs. 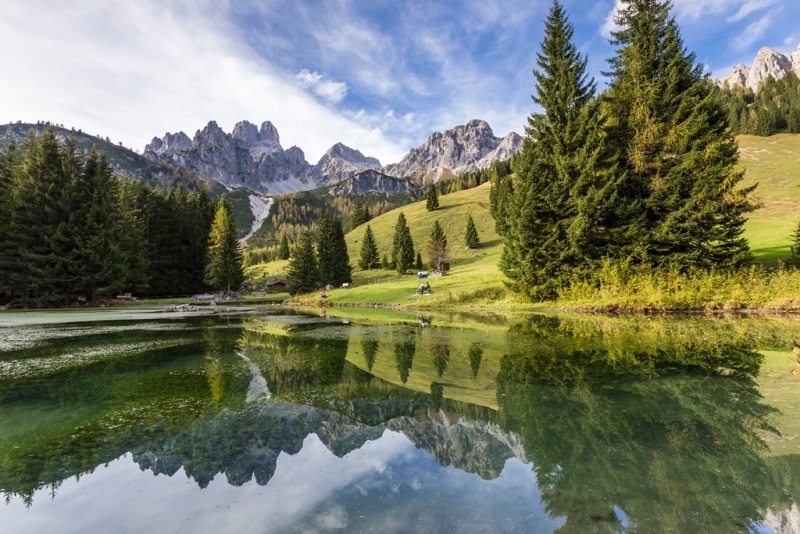 To finish off we take a detour to the wonderful Almsee Lake. Andreas, a geocacher, finds his second geocache at the Almsee. The first one he found near the Sulzkaralm. I was also able to register the caches – thus securing my first geocaches. And I also got my first taste at geocaching, a type of modern treasure hunting, which is increasing in popularity. From the Hofalm you can walk back down to Filzmoos along the varied, family-friendly footpaths. Tired legs prefer to travel back down on the Wanderbus. All in all it was a very interesting and beautiful day – I enjoyed it very much indeed. So all we have to do now is implement all Andreas‘ ideas he had along the hike. 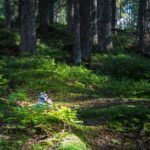 I’m curious to hear how you like them on your next hike along the Queen’s Trail in Filzmoos. “Pure nature“ – that’s my motto. I can really unwind whilst hiking or mushroom picking I’m also often out and about on my bike. In winter I just love whizzing down the Filzmoos slopes. The best thing is – I have everything on the doorstep – our region offers so many opportunities.